10. Not expensive, durable and can survive a few falls! When I went with this list, a helpful salesman pointed me to the Samsung 'Guru'. 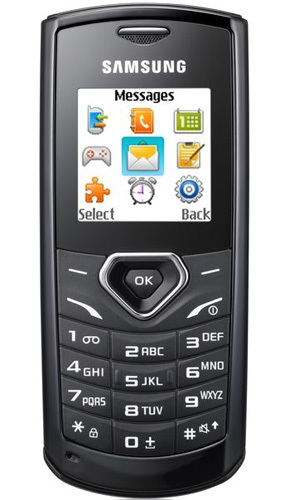 The Guru is a low cost dual-sim range from Samsung, but the cheapest model 1175 in this range is a single sim dual band GSM phone. What impressed me about this handset was the truly LOUD dual speakers (enough to turn me deaf), the large keys and the phone tracker facility that will let you trace your lost phone. Additionally, it has a giant 1000 mAH battery which has been going for 3 days now and is still at 75% after light use. I am quite impressed. Samsung does not provide bluetooth on this handset, but it does have upto 6 daily pre-set alarms (useful if you want to set a reminder for medications), an inbuilt torch, FM radio and Indian languge support. It retails at Rs. 1800 and is a good option for senior citizens. If I find any more, I will let you know!